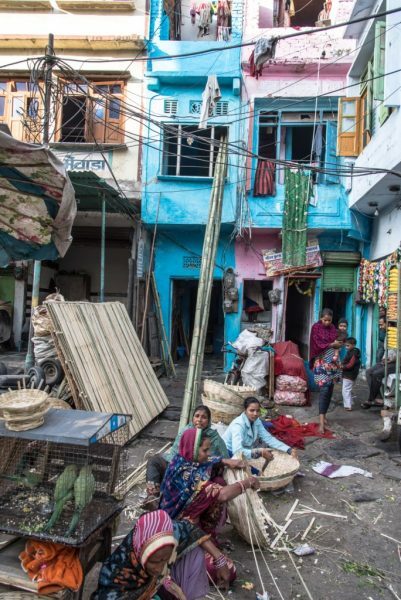 When I come across people of Udaipur, I come to know that the city is too huge to explore and extends deeply in a dark background having a variety of communities that once fostered in the arms of the city; deeper than we can perceive. One such community is ‘Ranchi’ that claims to be a community of the Darbar. The reason why they caught hold of my attention was their incredible art. 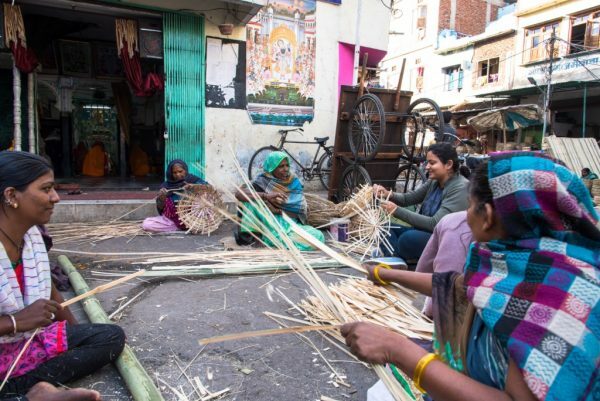 Amidst the hustle bustle of the old parts of the city, inside the ‘Mandi’ of Delhi-gate resides and works this community of people who make a living by their ancestral business of making bamboo baskets. This group of people have around 5-6 shops on the ground floor of their houses and run their ‘business’ from home. 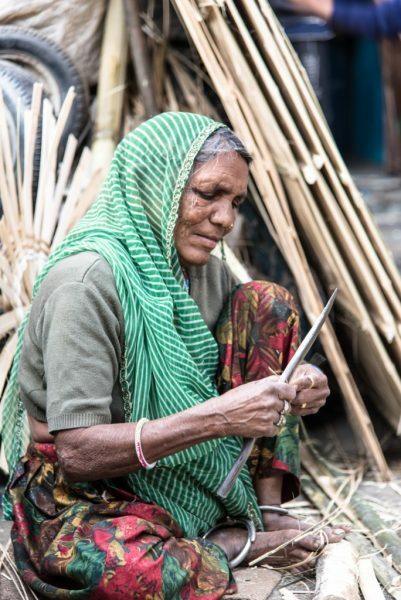 Parking my vehicle, I came towards a group of ladies sitting on the dirty ground, both ripened women and adolescent girls, who were rigorously making baskets by cutting and peeling bamboo barks. Spotting a camera they went a bit apprehensive and asked, “आप नगरपालिका से हो क्या? हमें यहाँ से हटवाना चाहते हो?” Explaining them generously why I came there brought them at ease. And then I came to know how kind and friendly these ladies were! They asked me to sit on the ground with them and weave a basket. The girls and their mothers were excited and weren’t much shy of the camera. 24 feet long bamboos are procured from Assam. 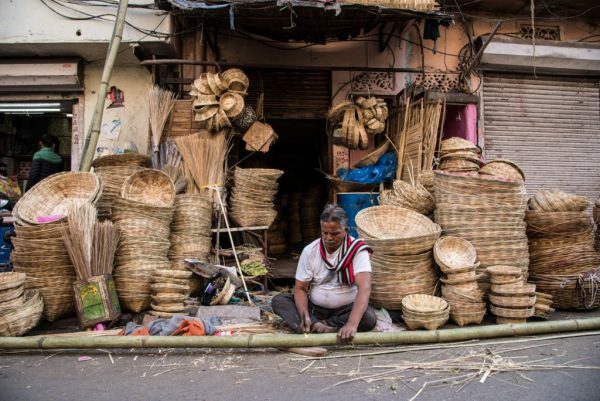 The cost of per bamboo is about 200 rupees and one bamboo can be made into only 5-7 baskets of moderate size. Peeling the bamboo and taking out thin and long wafers is the first step. Cutting them to a size that can be used for making a basket (Tokri) is their step two. After that, these pieces are given to another woman whose work is of making the basket. 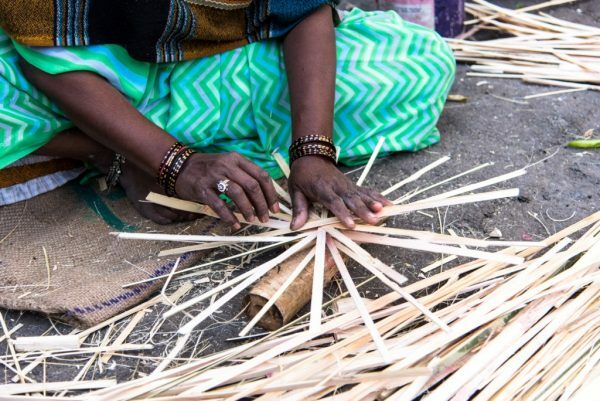 This is done firstly, by arranging 12 straight pieces to make a circle and then wrapping around thin, long, a bit elastic bamboo peels to give it a shape of a basket. 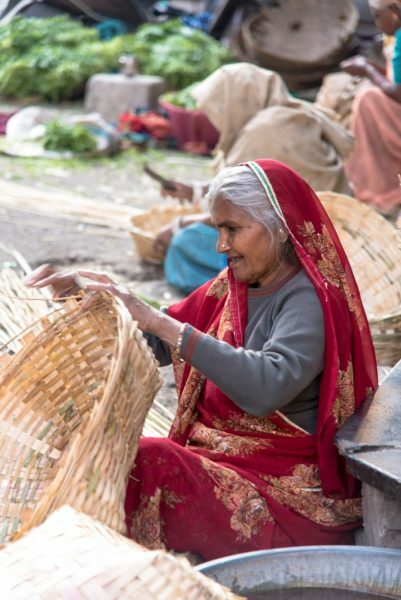 Each step of making a basket, from taking out the bamboo till the finished product, is carried out by different women of the community. Running into a conversation while weaving a basket, I came across their plight. 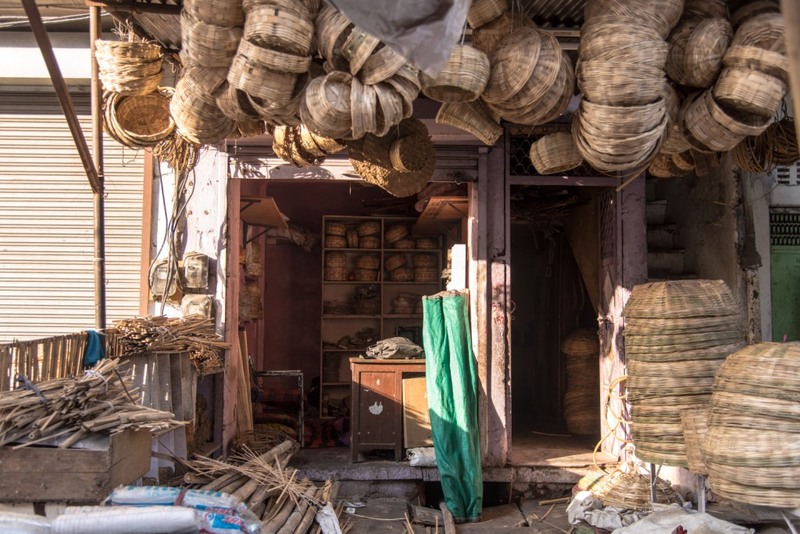 Once these baskets were used to store fruits, ‘Chappati’, ‘Poori’ and all kinds of Indian bread but today with advancement, usage of plastic and other fiber utensils (boxes), their bamboo baskets are suffering a downfall. These baskets are also used in taking ‘Prasad’ for the deity Shree Nath Ji. Also, these baskets are used in taking various marriage-related offerings such as fruits, dry fruits and much more. They sell these for Rs. 10 a basic basket and goes up to a maximum of Rs. 100, depending on the size. 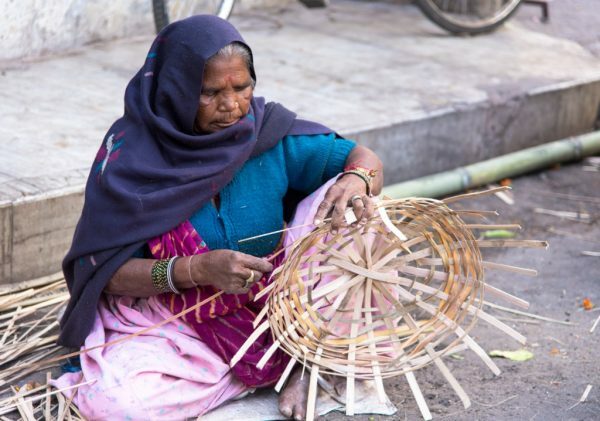 Men women both work together to achieve a living through making these baskets. So probably you can estimate their monthly remuneration. Their max earning is in the wedding season when people, due to tradition, buy these ‘Tokri’. Another is when people buy it for offerings made to their deity as mentioned above. Apart from these they also sell wood curtains, baskets with lid, mats, broomsticks etc. 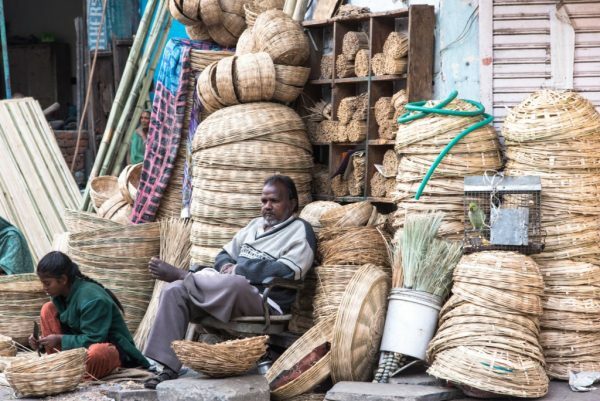 The concern is that this community and its art of making baskets are becoming extinct. Soon they won’t be having a mode of income and hence might opt out of this and look for something more lucrative. It is not just this art or work that is meeting its end; there are so many things around us that are under the dust of ignorance. Storing your food probably fruits in these baskets would give a kick to their dying business as well as prove a bit environment-friendly. The material used is bamboo, which is obviously eco-friendly. Disposing of these can also be easy as bamboo is a bio-degradable substance. If not helping the community, we can help ourselves and our environment by simply using these. Well, did you get the point? All lies in the fact of ‘helping each other’ and maintaining a mutual harmony. 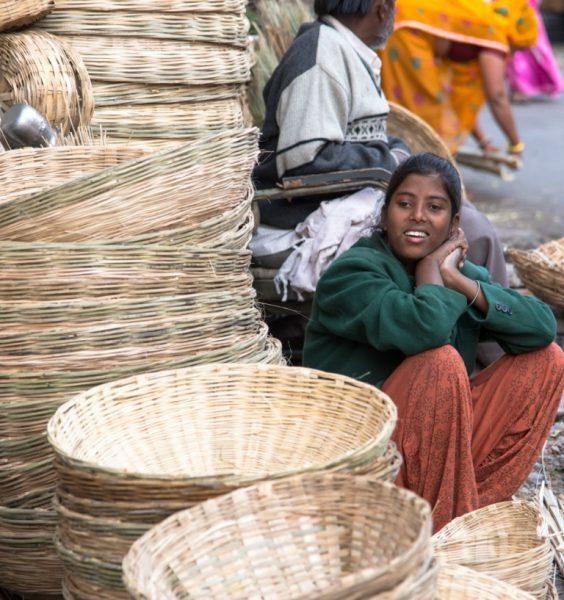 While buying baskets will help them survive, keeping these will help our environment. Have you got a basket yet? Previous articleस्वच्छ सर्वेक्षण 2018: नगर निगम ने खुद को दिये 1017/1400, आप कितने नंबर देंगे? Next article‘Honor Killing’ जैसे गम्भीर विषय को नाटक “पुकार” के रूप में दिखाया, शिल्पग्राम की रंगशाला में!